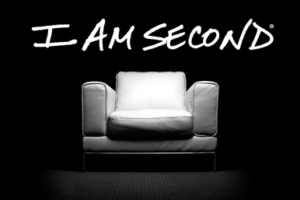 Welcome to our new series called, ‘I am Second’. The whole point of this series is about transformation. You are going to hear real people share their real stories and how they found transformation. That means they found peace, found healing and were able to break their addictions. I want to start with what scripture says. Do you see that first part? It says …put God first… That requires that we put ourselves in second place. That is the whole point of the, ‘I am Second’ series. That is the first step in being transformed. I will put God in first place in my life. I will no longer demand that I am first. Today, I have this long rope up here. This long rope represents all of eternity. This is what God sees. He sees it all. This is before creation and this is after Jesus returns. Imagine how God sees all of eternity. Do you see this little thread? It’s a small, small dot in time isn’t? That’s your life. It’s really, really, small when you look at all eternity. That means you are a speck in time. Based on this rope and thread, we can conclude that God sees all of eternity but we are only able to see or understand today. His perspective is unimaginable. Our perspective, not so impressive. We can barely remember what we ate for dinner last night. We can barely remember our homework from this past week. So God, who loves us and wants what best for us, writes a love letter to us, called the Bible, and says this. Why would God say that? Because He sees eternity. He knows what happened before you. He knows what is happening today. He knows what is best for you today. He knows His plans for tomorrow. Don’t be conceited, sure of your own wisdom. Instead, trust and reverence the Lord, and turn your back on evil. God sees all of eternity but we are only able to see or understand today. Put God in first place. I want to walk through a story with you. It’s a story of Joseph found in Genesis. To prepare you for this this story, you need to know that there was a man named Abraham. God loved Abraham and promised to bless him and all his children. Historians believe this happened about 2100 B.C. Abraham had a son named Isaac. Isaac had a son named Jacob. Jacob, his named was changed to Israel, had twelve sons, one of them was Joseph. In the days of Joseph, about 200 years after God’s promise to Abraham, what nobody knew, there was about to be a world wide famine for seven years. Part of God’s bigger plan was to move Abraham’s children, known has the children of Israel [aka: Jacob], to a place where they could be safe. That place was Egypt. Before we read sections of this story, remember, God sees eternity. We learn Joseph when he is 17 years old. That would make him a Junior or Senior in our world. Joseph’s dad liked him the most and he didn’t hide it. He made special clothes for him and honored him more than his older brothers. The older brothers deeply resented Joseph. Let’s read what happens. Time out. Think about this. What is Joseph’s reality? What does Joseph see? What does he experience? He sold by his family to be a slave. He is rejected. He is lonely. He is afraid. What does God see? God sees eternity. God sees 2100 years from Abraham to the birth of Jesus. God sees that promise He made to Abraham about 200 years earlier. God sees that the Children of Israel need to get to Egypt. God sees how important today is for the future of the Jewish people. Do you think Joseph understood what was happening? No, he is a speck in time. Do you think Joseph has questions for God? What is Joseph’s reality? What does Joseph see? What does he experience? He is a slave in a foreign land with no family. Basically, he now has no future. 10 She kept putting pressure on him day after day, but he refused to sleep with her, and he kept out of her way as much as possible. 11 One day, however, no one else was around when he was doing his work inside the house. 12 She came and grabbed him by his shirt, demanding, “Sleep with me!” Joseph tore himself away, but as he did, his shirt came off. She was left holding it as he ran from the house. What is Joseph’s reality? What does Joseph see? What does he experience? He did the right thing and his reward was jail. What could be worse than being a slave? Going to jail. In this last section, Pharaoh has a dream and Joseph is brought from jail to Pharaoh to interpret his dream. Let’s keep reading. What is Joseph’s reality? What does Joseph see? What does he experience? He is the second in command of all Egypt. Do you think Joseph understood what was happening? No, he is a speck in time. Do you think Joseph had questions for God? Let me ask you this. If God sees all of eternity would you trust Him? If all we can see is today, why would we not put God first? Maybe everything you are walking through is okay. Maybe we just need to trust Him. How would you live if you believed God sees eternity and loves you? We can only see a speck in time, we can not see eternity. So we fix our attention on… what we can’t see. This entry was posted in Faith, Stuck in Life. Bookmark the permalink. ← Words to Live By…Or Not.